Resume: In the old days coal miners took a caged canary down into mines. If the canary suddenly dropped dead, that meant that the deadly gas, carbon monoxide, was slowly seeping into the shaft... An order of magnitude increase in killing rampages in America over the last several decades is like canaries suddenly starting to drop dead all around us. It is an early indicator of much worse troubles to come. On July 7, 2016, the Afghan War veteran Micah Johnson conducted a military-style operation against the Dallas, Texas, police. By the time he was blown up with a police bomb disposal robot, he killed ? ve of?cers and wounded nine policemen and two civilians. Although most media don’t describe Johnson’s rampage as terrorism, that is precisely what it was. According to one common de? nition, “terrorism is, in its broadest sense, the use of intentionally indiscriminate violence (terror) in order to achieve a political, religious, or ideological aim.” Terrorism aims can be many: to create an atmosphere of fear, to influence policy, to punish or revenge, or even to destroy a particular group. Goals, however, are not always known, and frequently are in dispute. A more important characteristic of terrorist violence is that it’s intentionally indiscriminate. This is the de?ning feature of terrorism, as used in this article: violence is targeted not at a particular person, or persons, but at anybody who belongs to a particular group (or even the whole society). “Indiscriminate,” therefore, doesn’t mean “random.” Perpetrators of shooting rampages attack a speci?c target; it’s just not a speci?c individual. As the Harvard sociologist Katherine Newman writes in Rampage: The Social Roots of School Shootings, school shootings, such as the Columbine massacre, are typically aimed to destroy the entire school as an institution. Workplace rampages similarly attack a company, or the corporate culture as a whole, rather than individual employees or bosses. “Random” or “senseless” appearance of this type of violence results from the application of what social scientists call the “principle of social substitutability.” Soldiers on the battle? eld, for example, aim to kill people whom they have never met before; they shoot at whoever wears the enemy uniform. Enemy soldiers are socially substitutable. Similarly, Micah Johnson killed policemen who never did any personal injury to him. Furthermore, as best as we know, none of his victims had ever shot an unarmed black man. Johnson attacked not these speci?c individuals, but the institution they belonged to. The only difference between a rampage shooter, such as Micah Jones, and a terrorist bomber, such as Timothy McVeigh, is in the weapon. Both were terrorists, because they aimed not at individual people but at groups, social or political institutions, or entire societies. 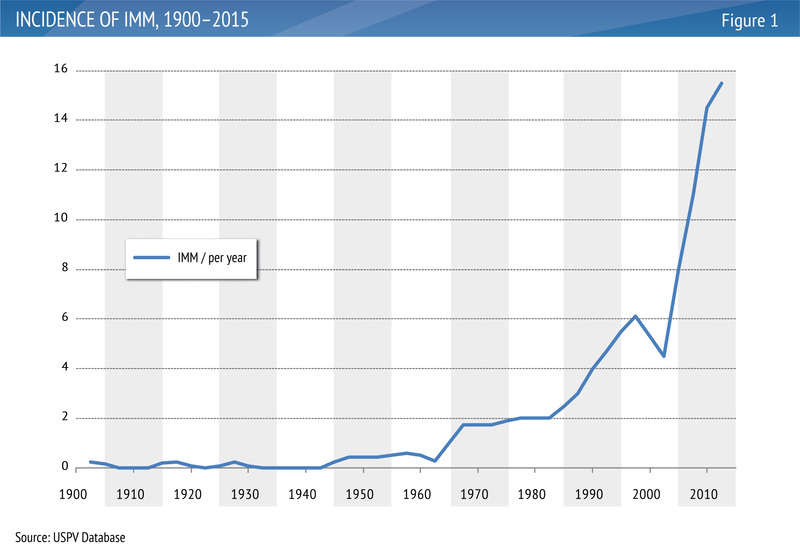 There are some complicating factors (the American population has grown, there have been some shifts in reporting patterns in the media), but a conservative estimate is that the incidence of IMM has increased over the past 50 years at least by a factor of ten. The United States is in a middle of a massive terrorist epidemic, whose magnitude and causes are poorly understood. This article argues that the IMM epidemic is a surface reflection of a number of negative long-term trends in American society. If we want to understand the causes of the IMM epidemic, then, we first need to understand how America has changed since 1965. Because human societies are dynamical systems, we also need to trace how changes in different components of the whole affected other components. My goal in this section is to explain these deep structural shifts in the American polity. The question I ask is not why Micah Johnson, in particular, decided to wage war against the Dallas Police Department, or why Timothy McVeigh used a weapon of mass destruction against the United States Government. The main question is, why have the number of such terrorist attacks increased so much over the last ? ve decades? An answer to this question is provided by Cliodynamics, a new “transdisciplinary discipline” that treats history as another science. Cliodynamic investigations have shown that all complex human societies, organized as states, experience periodic waves of political violence that usually escalate into state collapse, revolution, or civil war. Research on historical societies by the American sociologist Jack Goldstone, Russian historians Andrey Korotayev and Sergey Nefedov, and myself over the past three decades has enabled us to identify the structural causes of such instability waves. Our theory (known as the structural-demographic theory, or SDT) has been translated into mathematical models and tested on extensive historical material (see, for example, Secular Cycles). Ten years ago I started applying its tools to the society I live in: the United States. My research showed that each of the more than 40 seemingly disparate (but, according to the SDT, related) social indicators experienced turning points around the 1970s. Historically, such developments have served as leading indicators of political turmoil. A dynamical model I constructed, which encapsulates empirically observed interactions between structural-demographic factors, indicated that social instability and political violence would peak in the 2020s (see Political Instability May be a Contributor in the Coming Decade; the model is explained in Ages of Discord). The model represents complex human society as a dynamical system with three compartments: general population (the “non-elites”), the elites, and the state. I use the term “elites” in a neutral sociological sense of “power-holders.” This is, simply, the small fraction (typically, 1–2 percent) of the society who concentrates the bulk of social power in its hands. Social power comes in at least four forms: military (coercive), economic, administrative, and ideological. In the United States, traditionally, the economic elites have been dominant (see William Domhoff, Who Rules America? and Chapter 4 of Ages of Discord for details). Thus, to a first approximation, we can treat the elites in America as simply wealth-holders. For example, below I will focus on the segment of the American population whose personal wealth exceeds $10 million. But there is no sharp boundary separating the elites from non-elites (in fact, in our historical analysis we often subdivide the overall elites into subcategories, such as “magnates,” mid-rank elites, and lower-rank elites). The logic and details of how the theory works is explained in my recent book Ages of Discord: A Structural-Demographic Analysis of American History. Here I provide a brief outline. “Ages of Discord,” incidentally, refers to two waves of sociopolitical instability in American history. The ?rst took place in the nineteenth century (with the American Civil War as its peak), and the second one has been developing since the 1970s (and will probably reach its peak in the early 2020s). The most fundamental force in the structural-demographic model is the balance of supply of labor and the demand for it. 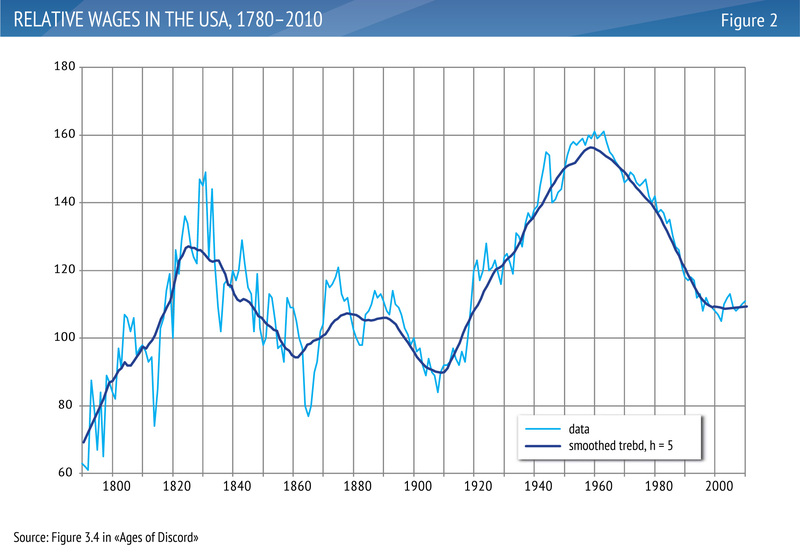 In the U.S. during the last ?fty years labor supply expanded much faster than the demand. This development was due to several factors working together: population growth (especially during the Baby Boom period), rising immigration (between 1965 and 2015 the proportion of foreign-born among America’s workers increased from 5 to 16 percent), and massive entry of women into the labor force. On the demand side two factors were the most important: the movement of American jobs overseas, as re?ected in the balance of trade (the last year of trade surplus was 1975) and, more recently, the loss of jobs due to technological change (automation and robotics). While the combination of forces affecting the balance of supply and demand for labor is complex, its effect on worker wages has been stark. This chart tracks one measure of how well workers do in an economy: the relative wage, de?ned as typical (median) wage divided by GDP per capita. Whereas between 1910 and 1960 relative wage grew essentially monotonically (apart from fluctuations due to business cycles), the trend during the last five decades has been downward. The steepest declines came after 1980. In other words, an ever smaller proportion of the fruits of economic growth went to the workers. Another way to look at this shift is to compare the trend in the real (inflation-adjusted) wages of American workers to that of their productivity. 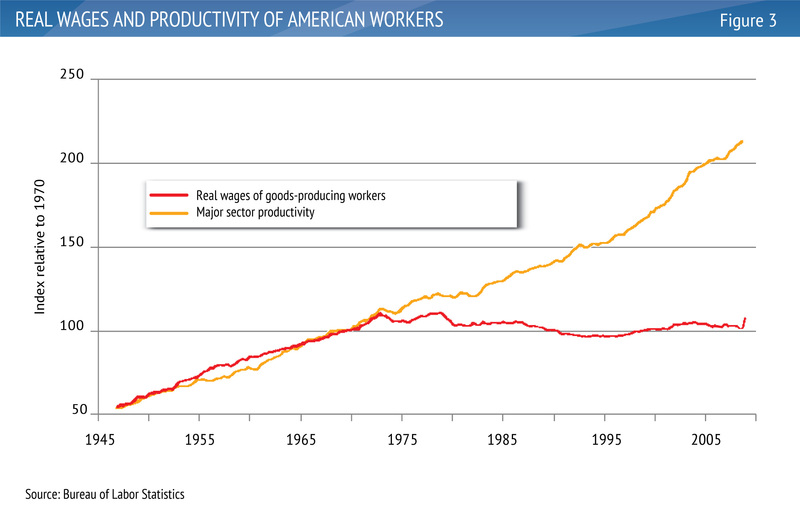 In the 1970s the two curves diverged: productivity continued to rise, but wages stagnated. Non-economic measures of well-being, for example, health-based indices, tell a similar story. Remarkably, the average height of native-born Americans, which increased rapidly during most of the twentieth century, ceased increasing after 1975. Even more striking is a recent decline of life expectancies for some segments of the U.S. population, such as middle-aged white Americans. Such developments as the divergence of productivity from wages, growing income and wealth inequality, and stagnating or even declining well-being of most Americans have been noted and discussed by social scientists and political commentators (although most tend to focus on a particular slice of the problem and don’t appreciate how these developments are interconnected). But another important development has been missed by most commentators: the key role of “elite overproduction” and intra-elite competition in driving waves of political violence, both in historical societies and in our own. Elite overproduction is also a consequence of the law of supply and demand. The elites (in both agrarian and capitalist societies) are consumers of labor. A low price of labor leads not only to declining living standards for a large segment of population (employees, especially unskilled ones), but also to a favorable economic conjuncture for the elites (more specifically, for the economic elites—employers). So far so good (for the elites). But there are several negative consequences of this development that gradually emerge over a generation or so. First, the elites become accustomed to ever greater levels of consumption. In addition, competition for social status drives “conspicuous consumption” (buying things to signal high social status). Thus, the minimum level of resources necessary for maintaining elite status exhibits a runaway growth. Second, the numbers of elites, in relation to the rest of the population, increase. The favorable economic conjuncture for employers enables large numbers of intelligent, hard­working, or simply lucky individuals to accumulate capital and then attempt to translate it into social status. As a result, upward mobility into the ranks of the elites greatly overmatches downward mobility. The third consequence is that the twin processes of declining living standards for the commoners and increasing consumption levels for the elites drive up economic inequality, leading to discontent from the increasingly poor (and increasingly disenfranchised) members of a society. As a result of the growth in elite appetites and numbers, the proportion of the total economic pie consumed by them increases. At some point there are simply too many elite aspirants chasing too few top positions in politics and economy. Elite overproduction is the SDT term for this imbalance between the supply of elite positions and the demand for them from elite aspirants. Elite overproduction leads to increasingly fierce intra-elite competition. Competition will be particularly intense for government positions whose supply is quite inelastic, especially at the top. A democratic system of government may allow for nonviolent rotation of political elites, but ultimately it depends on the willingness of established elites to relinquish power positions to new elite aspirants. But as numbers of elite aspirants grow exponentially, so do the numbers of frustrated elite aspirants who are denied access to power positions. As a result, intense elite competition increases the probability of violent intra-elite conflict. The theory, therefore, suggests the following generalization: labor oversupply should lead both to falling worker living standards and (after a time lag) to elite overproduction. These factors, in turn, undermine the stability and strength of the state (see below) and eventually result in a wave of prolonged and intense socio-political instability. As a note, although rapid population growth is one of the most important precursors of instability waves (and has been the main driver in pre-modern agrarian societies), it is important to stress that the structural-demographic theory is not a crude Malthusian model. Population growth causes political violence indirectly; its effect is mediated through social structures—most importantly, power relations between the elites and general population, within the elites, and between the elites and the state. The theory integrates insights of Malthus, Marx, and Weber in a dynamically coherent way. Here’s how this structural-demographic dynamic played out in the contemporary United States. The roots of the current American predicament go back to the 1970s, when, as I wrote above, wages of workers stopped keeping pace with their productivity. Divergence of the productivity and wages also resulted in the “great divergence” between the fortunes of the top 1 percent and the rest 99 percent. This development has been extensively discussed, but its implications for long-term political disorder are underappreciated. Increasing inequality during the last four decades lead not only to the growth of top fortunes; it also resulted in greater numbers of wealth-holders. The “1 percent” becomes “2 percent.” Or even more. There are many more millionaires, multimillionaires, and billionaires in the U.S. today compared with 30 years ago. As an example, according to the research by economist Edward Wolff, between 1983 and 2010 the number of American households worth at least $10 million (in 1995 dollars) grew from 66,000 to 350,000. In proportional terms, such “decamillionnaire households” increased from 0.08 to 0.30 percent of the total U.S. households. Wealthy Americans tend to be more politically active than the rest of the population. They support candidates who share their views and values (example: the Koch brothers). Some of them also run for of?ce themselves (examples: Michael Bloomberg, Mitt Romney, and most recently and spectacularly, Donald Trump). Yet the supply of political of?ces has stayed ?at. There are still 100 senators and 435 representatives, and only one U.S. President—the same numbers as in 1970. This is what “elite overproduction” really means. A related sign is the overproduction of law degrees. From the mid-1970s to 2011, according to the American Bar Association, the number of lawyers tripled from 400,000 to 1.2 million. Meanwhile, the population grew by only 45 percent. Economic Modeling Specialists Intl. recently estimated that twice as many law graduates pass the bar exam as there are job openings for them. In other words, every year U.S. law schools churn out about 25,000 “surplus” lawyers, many of whom are in debt. A large number of them go to law school with an ambition to enter politics someday, thus rising into the ranks of the American elite. Elite overproduction generally leads to more intra-elite competition that gradually undermines the spirit of cooperation, which is followed by ideological polarization and fragmentation of the political class. This happens because the more contenders (elite aspirants) there are, the more of them end up on the losing side.A large class of disgruntled elite-wannabes, often well-educated or wealthy, and highly capable, has been denied access to elite positions. This is why a multitude of desperate law school graduates and the politically ambitious rich are such a threat to the political stability of the American society. I don’t have the space here to discuss the third factor affecting the stability of large-scale societies in the structural-demographic theory (in addition to popular immiseration and elite overproduction): the declining ?scal health of the state. Currently, it is not yet of direct relevance to understanding the main question of this article, why we have an IMM epidemic. However, there is a fairly regular progression in how different structural-demographic forces become important as drivers of instability over time. Popular immiseration develops ? rst; then, after a time lag, elite overproduction; and finally these two factors working together undermine the fiscal health of the state (see Jack Goldstone’s Revolution and Rebellion in the Early Modern World). Presently, the position of the United States as the world hegemonic power, and its ability to print dollars at will (as long as the rest of the world accepts them) has enabled this country to delay the consequences of running massive state de?cits for years, indeed, decades. Summarizing the insights from the structural-demographic theory on the economic, social, and political dynamics in the United States, we see that over the last several decades social pressures for instability have been growing. The IMM epidemic is a surface indicator of these deep structural shifts. Socio-political instability can take many forms. In my analysis of political violence in the United States between 1780 and 2010 (Turchin 2013; see also the USPV Database) I distinguished three main forms, which the Americans have traditionally employed: riots (groups versus groups), lynchings (groups versus individuals), and terrorism (individuals versus groups). Through most of American history, all three main forms of political violence have tended to wax and wane together. But in contemporary America political violence is dominated by terrorism, mainly in the form of indiscriminate mass shooting. Why? To understand this, recall that the United States has the strongest and most capable state on this planet. Its military superiority over other world powers is obvious, but the American state is also very strong internally. The local police are loyal to the existing order, well-funded, and well-armed. In fact, the police have adopted much of the equipment and tactics, developed by the military in external wars, to control internal instability such as riots. The federal police (FBI) is also a highly capable organization. It is so effective that it’s hardly an exaggeration to say that as soon as a criminal conspiracy to undermine law and order grows to three members, one of them will be an FBI informer. As a result, political violence instigated by groups has been effectively suppressed. Lynchings have become extremely rare. Only spontaneous, unplanned riots, such as the 1992 Rodney King riot in Los Angeles, have any chance of developing into a serious political violence event. In fact, the authorities have adjusted their tactics following the Rodney King riot, and now the probability of a riot of similar magnitude is much smaller. The presence of heavily armed and heavily armored riot police is both a deterrent and a rapid reaction force should a demonstration turn violent. Thus, currently terrorism is the only outlet for the building social pressures for domestic political violence. And only when it is planned by one, at most two terrorists. The USPV Database shows a great variety of weapons that American terrorists have used: bombs, knives, anthrax powder, cars, and even an airplane. But by far the preferred weapon of the terrorist is the gun, for the obvious reason that powerful firearms are readily available for purchase in most U.S. states. According to the 2015 data, 40 percent of American households own at least one gun. Let’s brie?y review two possible explanations, alternatives to SDT, that are most commonly brought up in the discussion of IMMs in the mainstream media: guns and mental disease. Guns. Empirical evidence is overwhelmingly against the explanation that IMMs are increasing due to changing patterns of gun ownership. During the last few decades a series of laws have been passed that imposed more restrictions on the purchase of powerful ? rearms. Partly as a result of these laws, but perhaps having more to do with cultural change, the proportion of Americans who own guns has been steadily declining. The proportion of households with guns decreased from over 50 percent in the 1970s to about 40 percent today. Since the trend in the ?rearms runs counter to the trend in the frequency of IMM, it does not help to explain why the latter have been increasing. Mental disease. This is one of the most common explanations for the increased incidence of IMM. As Clayton Cramer writes, “At least half of these mass murderers (as well as many other murderers) have histories of mental illness.” The problem with this explanation is that there are literally millions of Americans who suffer from some kind of mental problem. For example, “in the early 1980s, there were about two million chronically mentally ill people in the United States”. Nevertheless, only a tiny minority of them commit mass murder. Furthermore, many mental disorders, such as most forms of schizophrenia, actually make their sufferers less violent (Metzl and MacLeish 2015). In retrospect, it’s easy to say that, for example, Adam Lanza, who killed 20 children and six adults in Sandy Hook Elementary School, had been previously diagnosed with Asperger’s syndrome. But Asperger’s syndrome is a mild form of autism with no known connection to increased propensity for violence (see Priscilla Gilman, “Don’t Blame Autism for Newtown”, New York Times). There is no evidence that the proportion of Americans with mental disorders has increased since 1965, and it certainly did not increase in parallel with the massive increase in the frequency of IMM. Remember that the incidence of IMM has increased by more than an order of magnitude. Some commentators point to the shift in the treatment of mentally ill during the Reagan administration. But, again, the curve of IMM incidence doesn’t show a “step up” that we would expect, if this were the primary cause. Another important observation is that the homicide rate in the US declined during the 1990s, which coincided with the so-called “incarceration revolution.” Many of the violently insane were locked up and the result was decreasing murder rates. But IMMs kept increasing. The divergence between homicide and IMM trajectories presents a serious dif?culty to both the guns and mental disease explanations. If IMMs are simply another type of homicide, why did the overall murder rate decline, starting in the 1990s, while IMMs kept on trending up? Even “mass killings”, murder that caused four or more fatalities, did not increase, or perhaps even declined between 1980s and 2000s. But the great majority of these killings are not IMMs, because they target speci?c individuals, typically starting as altercations between people who know each other. SDT considers indiscriminate mass murder as a completely separate conceptual category: it’s a type of political violence, distinct from crime, and therefore there is no reason to expect that homicide and IMMs should follow the same trend. Indiscriminate mass murder (IMM) is not just another type of crime, but a form of political violence: terrorism. More precisely, it is suicide terrorism, because the great majority of perpetrators are either killed by the police, or executed later (or, at best, experience social death by being locked away for life). It is not “random” or motiveless. The motive is not to kill a speci?c person, or persons, but to strike at a social group, at an institution, or at the society as a whole. The rampage shooters often see themselves as moralistic punishers striking against deep injustice.As Adam Lankford wrote in New York Times, a common factor in both rampage shooters and suicide terrorists is “a deep sense of victimization and belief that the killer’s life has been ruined by someone else, who has bullied, oppressed or persecuted him.” This “someone else”, however, is not a person, but a group, an organization, an institution, or the whole society, which is held responsible by the killer. The frequency of IMM depends, in the first place, on the state of the society; it increases as social pressures for instability increase. As the degree of cooperation in the American society declined over the last four decades, and the degree of intra-societal competition rose, increasingly large numbers of susceptible individuals feel they were victimized, bullied, and oppressed, and a certain (very small) fraction of them chose to become suicide terrorists to avenge such injustice. The fundamental forces underlying this social change have been two structural-demographic trends, popular immiseration and elite overproduction. The first was correlated with the deterioration of working conditions, the second with the growing social pressures on the university campus and in the grade school. Recollect that popular immiseration arises first, followed by elite overproduction. This is why the most common setting of early shooting rampages was the workplace, and why education-related IMMs followed later. In the last few years, we see an increased number of the third kind of attacks that aim at the state or its representatives. The main signi?cance of shooting rampages is not in how many people they kill. The numbers killed by these terrorists are small in comparison to how many people die by gun in the United States, or to fatalities from vehicle accidents. And indiscriminate mass murderers are loners who will not bring down the state, or start a civil war. The reason we should be worried about IMMs is that they are surface indicators of highly troubling negative trends working their way through deep levels of the American society. In the nineteenth century, coal miners took a caged canary down into mines. If the canary suddenly dropped dead, that meant that the deadly gas, carbon monoxide, was slowly seeping into the shaft, and it was time to run like hell. An order of magnitude increase in killing rampages are like canaries suddenly starting to drop dead all around us. They are an early indicator that something is changing for the worse. They warn of the coming of greater danger, but they are not the cause of it. Goldstone, Jack A. 1991. Revolution and Rebellion in the Early Modern World. Berkeley, CA: University of California Press. Collins, Randall. 1993. “Maturation of the state-centered theory of revolution and ideology.” Sociological Theory no. 11:117-128. Turchin, Peter. 2003. Historical dynamics: why states rise and fall. Princeton, NJ: Princeton University Press. Turchin, Peter, and Sergey Nefedov. 2009. Secular cycles. Princeton, NJ: Princeton University Press. Nefedov, S A. 2005. Нефедов С. А. Демографически-структурный анализ социально-эконо­мической истории России. Екатеринбург, 2005. Korotayev, Andrey, Artemy Malkov, and Daria Khaltourina. 2006. Introduction to Social Macrodynamics: Secular Cycles and Millennial Trends. Moscow: URSS. Korotayev, Andrey, Julia Zinkina, Svetlana Kobzeva, Justislav Bozhevolnov, Daria Khaltourina, Artemy Malkov, and Sergey Malkov. 2011. “A Trap at the Escape from the Trap? Demographic-Structural Factors of Political Instability in Modern Africa and West Asia.” Cliodynamics no. 2:276–303.